The heel of your rabbit’s foot is the hock. Taking a close look at the heels of an adult rabbit, you will usually find a small, bare, pale pink callused area right at the tip of the heel, covered by a fold of fur. The fur provides a cover for normal pressure and activity applied to the hock area. “Sore hocks” or Ulcerative Pododermatitis, are inflamed and painful areas on the heel. This area may weep, bleed or become infected. This is a serious concern, but it can be remedied and your bunny will be happy and pain free. Flooring is often the culprit. Inadequate or hard flooring can create pressure on hocks, removing fur covering and causing the skin to become raw and even break apart. Abrasive floor, including some rugs or play area surfaces, wear away the fur on the hock resulting in injury. Hutches or cage systems with wire or hard surfaces are injurious to rabbit feet. This type of housing is so problematic. We strongly discourage using outdoor hutches. Obesity creates excessive pressure on the hock and problems are more likely to arise. Chronic immobility due to aging or disease (arthritis etc..) contributes to hock issues especially if the rabbit is housed on abrasive carpeting. Long nails can be the cause as well. 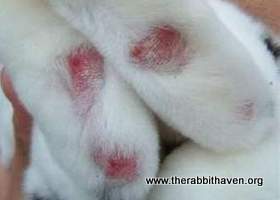 In rabbits with long nails the weight falls on the back of the foot resulting in sore hocks. Keep rabbit’s nails trimmed on a regular basis. Inspect the surface where your rabbit spends the most time. Create good quality flooring and make sure it is clear and free of abrasive material. Layers of fleece or soft cotton can provide a good flooring. Soft layers of sheets can also work. Some carpet is abrasive and can cause friction burns and injury, this needs to be modified as suggested. Bring your outdoor bunny inside where you can make sure the housing is safe and sanitary. No hutches, please. If the rabbit is obese, examine the diet for changes. Injured hocks can be treated with SSD 1% Cream or A & D Ointment or New-Skin. Check with your veterinarian for their preferred product. 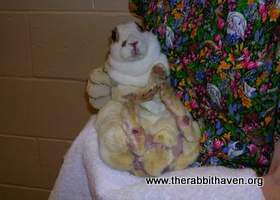 If your bunny has a severe hock injury, where the skin is broken and raw or bleeding, please see a vet ASAP. Your bunny may require systemic antibiotics as well as pain medication and a healing topical medication. Your rabbit’s injured hock may also require bandaging. Check you rabbit’s hocks as part of your home health check. To prevent sore, inflamed or ulcerated hocks, keep your rabbit’s nails trimmed, provide good flooring and feed your rabbit properly to maintain a healthy weight.